Have you noticed that the hair that is dyed, requires more care than hair that is not? Colored hair can be just as beautiful, but only with proper care. Hair colors contain chemical substances. No matter what is written on them, they change the structure of the hair and reduce nutrient levels in the hair. For this reason, color-treated hair needs further attention. Not all good shampoo for colored hair. Use one that will not wash off so fast color. It would also be good to use, and such a regenerator. Look for hair products that contain no sulfates because they will accelerate the rinsing of color, and hair will make dry and without shine. Hot water accelerates the rinsing of color. Wash your hair with lukewarm water. Also be careful when you swim in the pool because chlorine can wash color, and change its hue. Put swim cap and swim safely. After a swim in the pool immediately wash your hair and apply conditioner generously or mask for colored hair. Colored hair yearns for deep regeneration. In this way will remain soft and supple. You can do your hair mask that will provide her with a deep regeneration. In a blender, mix the avocado and almond oil. Put on the hair and hold for 10 minutes. Wash your hair as usual. Sunny days are good for your mind, but not for colored hair. The sun’s rays can accelerate the rinsing of color and change its hue. When the days are sunny, protect hair with hat or wash your hair with shampoo that has UVA and UVB protection. In this way, the color of your hair will remain much longer lasting, and reduces the risk of damage to the hair. Do not settle with dry hair without shine. Even if it is colored, it can be shiny and soft. 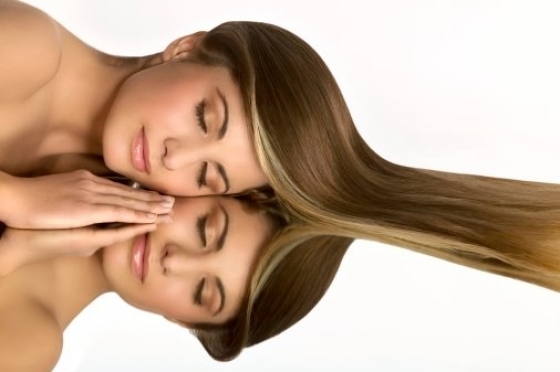 If you have difficulty with your hair because it looks lifeless, it would be best to seek the advice of experts. Hair salons now offer many options that will give to hair color brilliance. Consult with an expert and choose the method of returning shine that suits you best. When you see the first gray hairs, you’ll probably want to start immediately to dye your hair, even if you never did before. Before reaching for the dye and dyed yourself, seek the advice of experts. Gray hairs are less noticeable with lighter shades of color. If the lighter shade is right for your face and skin, there is no reason to not try. Next: What skin speaks about the health of the cardiovascular system? The best bait for men: This is a basic rule of attraction!